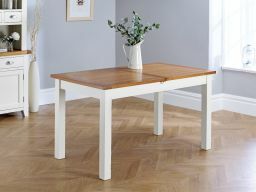 Country Oak 1.4m - 1.8m painted extending dining table. 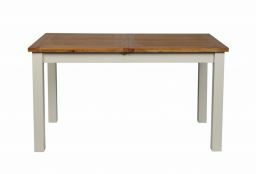 These tables are finished with Grey painted legs and frame with a natural waxed oak table top. A chunkly farmhouse style design that is ideal for seating a medium sized family of 4 - 6 people. Matching chairs and sideboards also available. 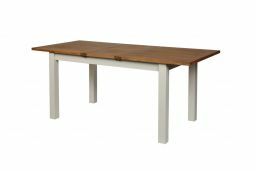 Dimensions: W1400mm x D800mm x H790mm extending to W1800mm with a 40cm extension that folds away below the table top. Easy to set up. 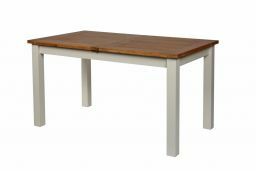 Really good quality table. The extending feature is straightforward and easy to use. The legs are not really grey, more of a cream colour but this is not a big deal for me. Delivery was also quick and efficient, the delivery men called 15 minutes before they arrived, which I really appreciate and find helpful. Good looking table delivered promptly. I would say the legs are not grey as I had hoped but a putty. Colour. Very happy with table, it is of good quality and was a very good price. 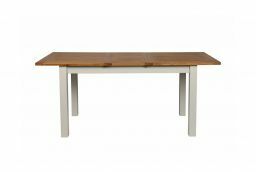 Although, I am happy with the grey painted legs and sides of the table, I would describe the colour as taupe. Solid ,well made and easy to put together. I received a phone call from the company to arrange delivery and then a phone call on the day of delivery from the delivery men . All in all an excellent service and great table. 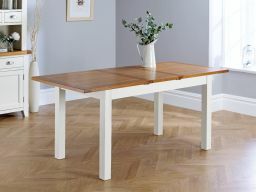 Great quality at a good price, easy to assemble and to extend, love the Greg legs which completely match my kitchen units. Fast delivery, fantastic price for a quality piece that was easily assembled in minutes. I am really pleased with it and I would definitely buy from the company again. Lovely table, exactly as it is in the picture.